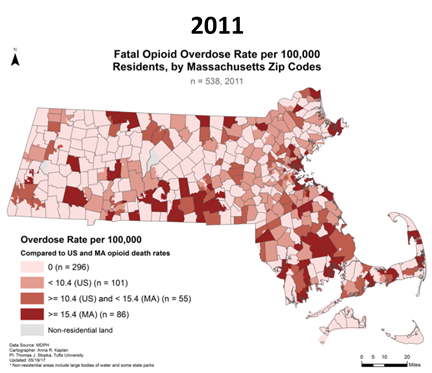 Massachusetts has the fifth highest rate of opioid deaths and overdoses in the nation. As part of Chapter 55, the Massachusetts Department of Public Health has provided a trove of healthcare data including hospital admissions, insurance claims, pharmacy transactions, ambulance trip reports, incarceration records, and medical examiner reports. 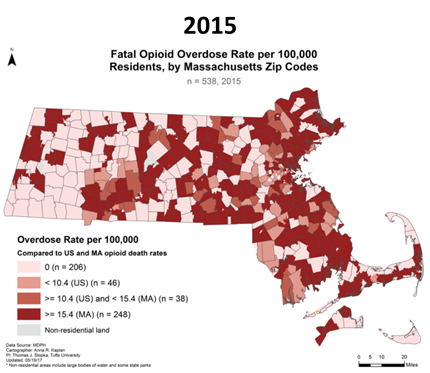 MITRE led one of 34 projects in this innovative public health study, and we welcomed the opportunity to bring together some of the foremost thinkers on opioid addiction today to discover new possibilities, create unexpected opportunities, and collaborate with Massachusetts to overcome the opioid crisis. One key to understanding and addressing the opioid epidemic is data. At MITRE, having trusted access to sensitive data is critical to our unique vantage point working with government, state, and local entities to solve challenges of national importance. Working with CMS, HHS, the Veterans Health Administration, and the DoD Health Agency, we also have ambitions to make Massachusetts the beacon for national learning. More than 2.5 million Americans are struggling with addiction to opioids, including prescription painkillers and heroin. In 2015, opioids claimed more than 33,000 lives in the United States, according to the Centers for Disease Control and Prevention. Between 2016 and 2017, the number of drug overdoses jumped 21 percent nationwide, with deaths from synthetic drugs such as fentanyl nearly doubling, the CDC estimates. Harvard Medical School experts recently joined Governor Charlie Baker to discuss the state of the opioid crisis and ways to stem the tide of the epidemic, including public and professional education, student and clinician training, and recommendations for best practices.